#FIBAOQT: Gilas Pilipinas vs. New Zealand Results and Full Video (July 6, 2016) - Balita Boss! 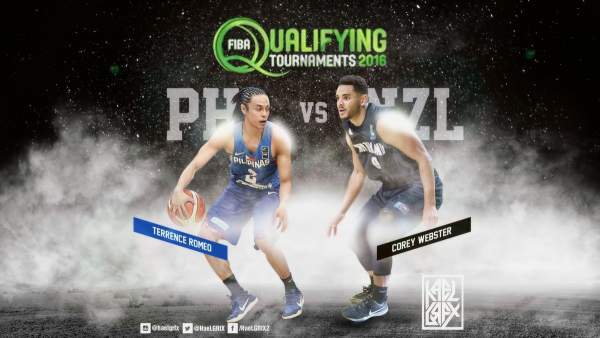 Gilas Pilipinas, the Philippines men's national basketball team, is set to face off against the New Zealand in the second day of 2016 FIBA Olympic Qualifying Tournament (OQT) in Manila, Philippines. This is the first game of New Zealand in the tournament. The Philippines, meanwhile, have lost their first match against France. Here's the 2016 FIBA Olympic Qualifying Tournament information for Philippines vs. New Zealand. Result: New Zealand defeated Philippines, 89-80. Gilas Pilipinas versus New Zealand will be broadcast live on TV5 and HYPER on CIGNAL in the Philippines. The free official live streaming video of Philippines vs. New Zealand is embedded above courtesy of Sports5 YouTube Channel. This crucial match is a do-or-die game for Philippines and a must win game for the New Zealand. New Zealand national basketball team will be led by Corey Webster, their leading scorer in previous FIBA tournament, veteran Mika Vukona, promising big man Isaac Fotu and team captain Mika Vukona. The other players that included in the New Zealand's Final 12 are Tai Jack Webster, Shea Ili, Everard Bartlett, Derone Raukawa, Thomas Abercrombie, Benny Anthony, Robert Loe, Jordan Ngati and Michael Karena. Gilas Pilipinas is leaning on naturalized player Andray Blatche, Terrence Romeo, and Asia's best point guard Jayson Castro to carry the team as they look for a massive upset against powerhouse France. Also representing the Pilipinas basketball are June Mar Fajardo, Gabe Norwood, Japeth Aguilar, Ray Parks, Ryan Reyes, Troy Rosario, Jeff Chan, Marc Pingris and Ranidel De Ocampo.